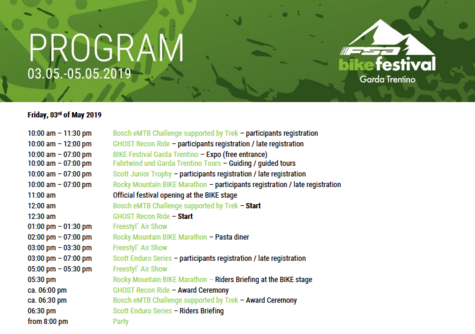 Besides the well-known races, like the Rocky Mountain BIKE Marathon and the Scott Enduro Series, all visitors and participants can get excited about some additional highlights at the BIKE Festival. A new track awaits all enthusiastic eBike riders at the Bosch eMTB Challenge supported by Trek. For the first time the race takes place in and around Arco. The guys of the Freestyl'Air Show will enchant La Rocca in the centre of Riva with their new program and more than 170 exhibitors will offer their products at the fair. With the Scott Junior Trophy, the Open Night and the parties the program will be satisfying for everyone.